Amaravati is another famous Buddhist site located close to the Krishna River and is believed to date to around the 3rd century BCE. The large mahastupa was originally built by King Ashoka while many other buildings are said to have been constructed over at least four phases. The Amaravati ruins first caught the attention of scholars in the late 19th century and a number of collections of artifacts from Amaravati complex are exhibited in a number of museums around the world. Relic caskets were discovered here during the excavations conducted during the period of 1957-67 at the mahastupa site. It is said that there is evidence to state that a Mahayanic site was later transformed into a Tantric Vajrayana site. The style of sculpture style is in fact referred to as the Amaravati School of Art or Amaravati Sculpture and is well known for its narrative style. A few years back there was an excellent Malayalam movie called Nottam which was based on the life of Kudiyattam performers (See few clips). David Shulman has a long piece in The New York Review of Books about this art form. 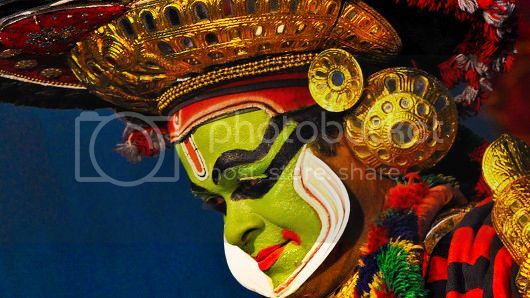 Kudiyattam plays, always based on classical Sanskrit texts, many of them composed in Kerala, invariably include a long nirvahanam or “retrospective” in which a character reveals, mostly by the silent language of hand- and eye-gestures, abhinaya, the long process that has brought him or her to the present moment in the play. In the course of performing this retrospective, the solitary actor frequently adopts other personae, always signaling such a transition by a coded move familiar to the spectators—usually by tying or untying the tasseled ends of a long cord that forms part of his elaborate costume of red, white, and black cloth, rich ornament with many reflecting surfaces, and a high headdress. This condensation of many voices in a single actor (called pakarnattam, “exchanging roles”) is a hallmark of the tradition and a clear innovation in relation to what we know of classical Sanskrit drama. Sanskrit verses and prose passages from the original text of the play are recited, or rather sung, always in a peculiar, high-pitched musical style that includes several distinct ragas or recitation modes; but the great bulk of the performance is devoted to the actor’s silent enactment and elaboration of such passages, to the accompaniment of the drums. One of Dirks’ most important books is Castes of Mind: Colonialism and the Making of Modern India in which he argues that India’s contemporary caste system was largely a colonial invention. This isn’t to say that there wasn’t something called caste before colonialism, just that caste in its present form was shaped by the colonial process. Nor was this shaping of caste purely a top-down matter, but something that happened through a process that heavily involved the Indian people themselves. Both the Brahmins who worked closely with the British to encode the caste system in the new bureaucracy, as well as the ordinary people, many of whom organized politically to ensure that their caste status was listed favorably in the census. While the “invented” nature of caste is still a matter of considerable academic debate, much of the debate is over how extensive and how formalized caste was in pre-colonial India. Most scholars accept Dirks’ argument that caste was profoundly altered as a result of the colonial encounter. The cinchona bark was the source for quinine and was required in large quantities to deal with the malaria fever which was rampant all over India and many other parts of the world. The cinchona bark was brought to Europe by the Jesuits and was called the Jesuit bark. The demand for the bark soon outgrew the supply. European powers vied with each other to get hold of the seedlings so that it could be planted in their colonies in Africa and Asia. But it was only by the middle of the 19th century that the cinchona seedlings were successfully smuggled out of South America. By 1867, the commercial cultivation of cinchona in the Nilgiris gained popularity. Cinchona was planted in a woody ravine on the slopes of the Doddabetta. Labor was scarce and many of the government and private plantations used convict labor to clear the jungle and to plant cinchona. The convicts were mainly Chinese from the Straits Settlements and some from mainland China. After they served their time, these Chinese men married Tamil women and settled down to live in Naduvattam; making a living out growing vegetables and from dairy farming. In 1888, a rich man named Buchi Babu created the Madras United Cricket Club and that marked the birth of Indian cricket in the city. Sriram writes about Buchi Babu. Most of the members were boys from poor families. Parents considered cricket a waste of time and very reluctantly allowed the boys to play the game. Orthodoxy was another factor, for cricket did not recognise caste barriers. It was common for players to slink away from home in dhotis and then change to trousers at the venue, for leaving home wearing trousers was a sure sign of going out to play. Opposing teams were invariably from schools and colleges. And it was from them that Buchi Babu selected promising youngsters. He imported shirts, trousers, cricket boots, bats, balls, gloves and other equipment for his players and encouraged them in every way. Over time, the MUC became known for its six perfect pitches, all better than those of the Chepauk-based, English-only Madras Cricket Club (MCC). And it was Buchi Babu’s dream that his MUC would one day be invited to play against the MCC. Airawat, writing in Military History of India, has a brief history of the formation of Himachal Pradesh. Sardar Patel had supported the cause of Himachal Pradesh and admitted as early as 1948 that “the ultimate objective is to enable this area to attain the position of an autonomous province of India.” On the other hand, Nehru and other Congressmen considered HP to be economically unviable and were pushing for its merger into Punjab…..no doubt with an eye out for the completion of the Bhakra-Nangal project. One of the other arguments made was that HP lacked administrative officers of good calibre since the territory was mostly made up of princely states. But the local leaders as well as princes of Himachal opposed such a merger on cultural and geographical grounds. With this edition the Carnival completes 5 years with the help of regular contributors like Sandeep V and Feanor. If you have any links for the carnival, please send it to varnam.blog @gmail. The next carnival will be up on Jan 15th.